Its been an awesome experience, and it feels like there is so much more to this project and ways to grow this thing. The idea came together with an artist from Finland, Nora Emilia, who paints incredible portraits and never exhibits. Why? Because she has no artistic network here in London, and she can’t afford to exhibit in an expensive show, she doesn’t know any galleries that will give her a chance, how to go about the whole thing and can’t even afford her own studio. So she just paints in her house and the cat gets all the joy. Sod it, we thought. If we could only just find a space at minimum rent and enough artists in the same position, we might just be able to do something about it ourselves. There is so much exciting fresh art coming out of London still, but these are not the boom days where anyone could find a half-empty butchers on Brick Lane and set up a speakeasy selling cans of red stripe. Venues are hard to come by at cheap rent. East and now South London has gone to the boring office workers and post-hipsters as we all know, and so those budding artists have retreated to their bedrooms. On top of that, although there are small pockets of artists living in one area, like Tottenham, this is a very different environment from the likes of Tracey Emin/Sarah Lucas and particularly those that followed them and eventually triggered actual galleries opening up all around Bethnal Green and the East End. In those days there was a concentrated mass of artists and art lovers living in one place, with Brick Lane, Redchurch and Vyner Street at the epicentre. People trawled around the streets every Thursday knowing they would stumble across openings without checking if anything was on. You had your audience right there in a place where you could fall over the empty cheap spaces. But in this harsher environment. THERE IS STILL HOPE! we shout. YOU CAN STILL DO IT IF YOU WANT TO – JUST DO IT. With the Bedroom Artists Collective we are not thinking small. For our first show we found a huge ‘meanwhile’ ex-office space taken on by the Hive Dalston for community projects who charge minimum rent for art shows (and are lovely, lovely people too). We put a call out in artjobs.co.uk and lo-and-behold over 50 artists responded. All worked without studios, had day jobs or studied or both, all loved the idea. By the time we got down to the nitty-gritty we still had 36 artists and we put on an incredible show. Photos below – but read on because there is more! The Hive event showed the huge interest out there for low level, rough and ready exhibitions. In reality they are the best type of exhibition, because not only are you enjoying the art but how a space has been used creatively for something it wasn’t meant to be used for. And if its temporary too, it makes it a unique experience. People can’t even afford the rent on their own flats these days let alone a studio space, or the extra time, the effort, it takes to promote yourself as an artists, to get that extra level more advanced at your practice (and your passion) on top of your day job. Its a real struggle for most artists out there that are ’emerging’ or as we now like to say ‘submerged’ because some of them have been that way for years. It all comes down to money (and lack of it). So the Bedroom Artists Collective want to bridge the gap. We didn’t know we did but the more we work on this project the more we realise that is exactly how we fit in. We’re giving artists a leg up. Once you exhibit you get that buzz, you want to do it again, you get more ideas, you see your work up in a gallery space, it makes you think – what should I do next? Not only that you get the chance to find other artists, collaborate or help each other in some way, you get promotion through the collectives online channels, you get something on your portfolio, you get to network with other artists and you get your artwork out there to new audiences. And what does everyone else get? To see exciting, unusual art that pushes the boundaries in weird unusual spaces. And we find that a lot of the people that come to the shows do some sort of creativity themselves in their homes, and it gets them thinking too. Possibly inspiring them. So we think if you want to go round the establishment you still can. Its exactly the same as it always was. And the more people that do it the better. So for anyone out there with big ideas or beautiful incredible things sitting in their home, its not that hard if you have a bunch of people to do it with you (and you can find them easily through artjobs and other sites), and you can do it on a shoe-string just like we did (our budget for the Hive show was £400 for 36 artists exhibiting and we split the bill between everyone). It just takes a bit of creative thinking and that’s what artists are good at right? There will be abandoned spaces near you, there will be spaces that owners don’t know what to do with, just sitting there, that will welcome a bit of money for an event that brings people to their place. Anyway…it’s interesting being on the other side. Next time… back to regular Artsleuth business! Catherine Borowski’s white banisters are lined up along the concrete floor in rows, which gives a strange illusionary quality to them and eerily evokes the rows of graves at a war memorial site. Banisters could also signify a passage of ascension or descent; stairways are somewhere you rarely stop on, they are part of a journey. Seriously, actually, when you consider ‘the banister’ in isolation there is more to them than you think. Everyone can project their own memories on these inanimate objects. The Artist said she was always jealous of friends that had stairs as a child, it signified a more comfortable living, having grown up in a flat on an estate. Also, she said, her mother was buried in a memorial graveyard in the Middle East, where Borowski was never to find her gravestone. Another piece is a clothes rail built into a section of wall. Assorted hangers are on the rail, some with clothes on them, some with their dry-cleaning plastic covers on. A framed print of human figures lies on its side on the ground. The blurb tells the story of the day Borowski cleaned her mother’s wardrobe out after she had passed, found 45 years worth of hangers and a Henry Moore sketch never to have been hung on a wall stuffed in a plastic bag behind the clothes. On the walls around the banister installation are the artworks of Lee Baker, whose style evolved out of a passion for Manga among other things. His most recent output is along the Japanese theme of ‘Mono’ (or transience). These are large floral pieces, which leave the canvas with an unfinished look. Most are dramatic and scaled up, bold, stylised flowers, on bleak, winter-like backgrounds. The rough surfaces mimic rust and concrete and are a perfect foil to the smooth block colours of the floral shapes on top. He has taken this approach one stage further in the installation on the back wall. An old mattress is the canvas, with the stalk of the Chrysanthemum running onto a piece of chipboard and an old ripped sheet below. There is a wooden palette and other building materials arranged around them in a disused state. Materials you might find in a squat perhaps. On the right wall are a series of pieces by Baker from 2015. They are scaled down, framed, detailed sections of stripped wall, the kind you would find in a house halfway through renovation after the stripper has been used. A nice simile with the banisters somehow. Its always a pleasure to find sixties wallpaper which wouldn’t have looked out of place in Del Boy’s flat under the surface of the obligatory magnolia upper coat. It’s a lingering memory, a visual history of the people who lived the place. Also too, it is a micro history, here depicted in micro form. Each brick in the fresco model versions are about a fingerprint in length. In the backroom is an installation by Olivia Hegarty. A jungle of what looks like starched paper, or white fabric, is dangling from string at all different heights. When you touch it, and you cant avoid it as they are purposefully packed into the room, the material crumbles. It’s brittle and you realise its something else, it’s filo pastry. A frivolous, beautiful idea and the shadows dance in the light. You Get What You’re Given @The Hoxton Arches. Thanks to Nathan Sonic for the incredible photos. Once upon a time on an imagined weird alien planet not so dissimilar from our own, stories play out in incredibly detailed hallucinogenic landscapes. Some scenes are about the daily grind; like commuting about town, taking your gimp for a walk, underground factory slaves toiling while the tube rattles by, scientists performing weird experiments surrounded by odd gadgets and multicoloured tentacles, and some serious space mining business on a stellar surface. Other scenes delve into the underbelly of these Crang-like being’s debaucherous recreational pursuits. There are bars where unanimous projectile vomiting is the thing to do, wild rock concerts, trippy raves, lavish house parties and chillaxing in the pool in some tropical space-scape while a robot-head-hoover-thing brings you cocktails. As possibly callous as their society might be, they do know how to party, that’s for sure. There’s something a little of the ancient Roman, Mayan or Egyptian about these folks with their odd rituals and lives. And there are odd symbols everywhere, tongues and tentacles, clouds and bums. A section of this exhibition shows single characters, fleshing out the details of some of the more notorious figures of this world. The more you look, the more you find in this works. It’s like peeling a psychedelic onion; a sci-fi novel ‘with your eyes’ if you will. One of the pieces (not shown in the images above) is a huge graphite sketch scene split into a tryptic. It re-imagines the beautiful madness of Hieronymus Bosch’s heaven and hell and other similar works. You can see the bond between some of art history’s heavyweights in the macabre and the surreal (for instance Goya) in what Dogboy has produced in this collection. (Stour Space also has a really nice cafe where you can sit by the canal front and mull over the increasingly dire fate that has befallen Hackney Wick… but thats another blog…coming soon). From long term blogger on the London art scene to doing something about it…Art Sleuth has become part of the action. We’re organising a group show with 36 emerging artists. Each of the artists works without a studio, has no gallery representation and most have no way of exhibiting alone. But together, it turns out, we can. With the help of Hive Dalston – a place with a special bond to the Bedroom Artists’ cause as a not-for-profit organisation hell bent on helping emerging artists in anyway it can – we have been able to put on an enormous exhibition covering everything from painting, illustration, sculpture, live art, instillation, sound-video art and street art. We’ll also be putting on workshops through out the weekend including an amazing Urban Boxes Workshop, by Flora Malpas exploring the idea of urban regeneration through creating buildings out of recycled packaging such as cardboard boxes and plastic bottles. And another workshop which will be a tour and discovery of the works by Cedoux Kadima. Artists will be using the space to create art throughout the weekend, and we’re hoping some collaborations will take place between the artists. You can imagine what The Doodle Man did in science classes at school. Go visit him at his gallery show to see what happened next; it’s amazing. He took 8 days to cover almost every inch of wall space of the two rooms at the Hoxton Gallery, Old St, mainly with one never-ending monochrome doodle piece. He’s also done a table and chair set,canvases, a moving video doodle, and prints to buy at reasonable prices. Plus he’s there doing his doodle thing in his doodle outfit, looking wicked. We salute you Mr Doodle. 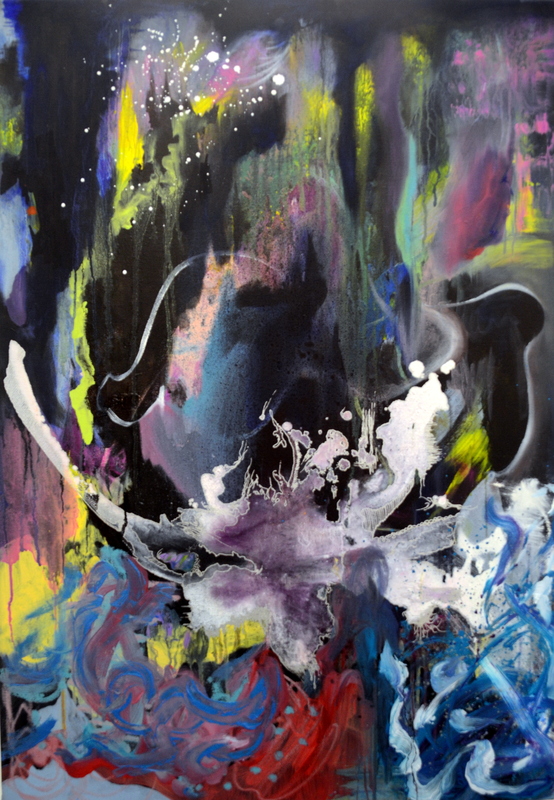 From Here to Eternity, Gavin Nolan, 2014, Oil on Canvas. Back to the Drawing Board, Joella Wheatley, 2014, Oil, Acrylic, Pen on Canvas. Amicably sitting side by side once again is Saatchi’s New Sensations group exhibition, showcasing emerging talent, and The Future Can Wait with their select display of ‘mid-career’ artists. It’s become a good pairing because you can see the development in artists’ work from those just starting out to the more established in the next room. Plus it’s interesting because inevitably a lot of artists that first show in New Sensations then exhibit with The Future Can Wait a few years later. One thing that’s noticeable between the two exhibitions is the difference in approach to sculpture and installation. The TFCW’s has more refined, tongue-in-cheek artwork, but with this sacrifices a more playful approach to things. New Sensations displays a number of different large found-object arrangements and earthy land art style pieces. The sort of pieces that take influences from the late 70’s movement such as Woodrow and Long. The outstanding contribution comes from Daniel Silva who uses materials such as beeswax and found wooden items to create wholesome and effective compositions. Another artist featured strongly in the NS show is Emily Motto whose clever use of playdoh and rising bread oozing slowly through porous materials in luminous colours creates ever changing, playful installations. TFCW was exhibiting the surreal work of an Wendy Meyer who has made touchingly comic waxworks of new-born babies – they are so small they can fit in gravy boats, jewellery boxes and wine crates – referencing the work of Ron Mueck. Also showing was Claire Partington‘s incredibly fine ceramics depicting two Tudor ladies with detailed finery having a fight so violent it has drawn blood. One more thing to ponder on. A macabre oil painting by Mr and Mrs Phillip Cath called The Awakening Conscience. Is this something to make us think twice about eating pigs? According to scientists a full grown pig has the mental age of a 1.5 year old, so is this a depiction of the pig’s awakening conscience as well as ours? Answers in the comment box please (or a postcard if you’d prefer). The Curious Duke gallery shares premises with Taylored Frames Ltd; the Framer himself here at the opening with his pet rat. The Curious Duke Gallery launched their first Secret Art Prize at their residency on the infamous street for urban art, Whitecross Street, in early September. The founder Eleni Duke says there is no similar prize to encourage Surrealist and Urban Art in the UK and that’s why she’s championing this opportunity for unrepresented emerging artists working in that field. They had over 160 applicants with the top ten selected artists having their entries exhibited from now until 27th of September. 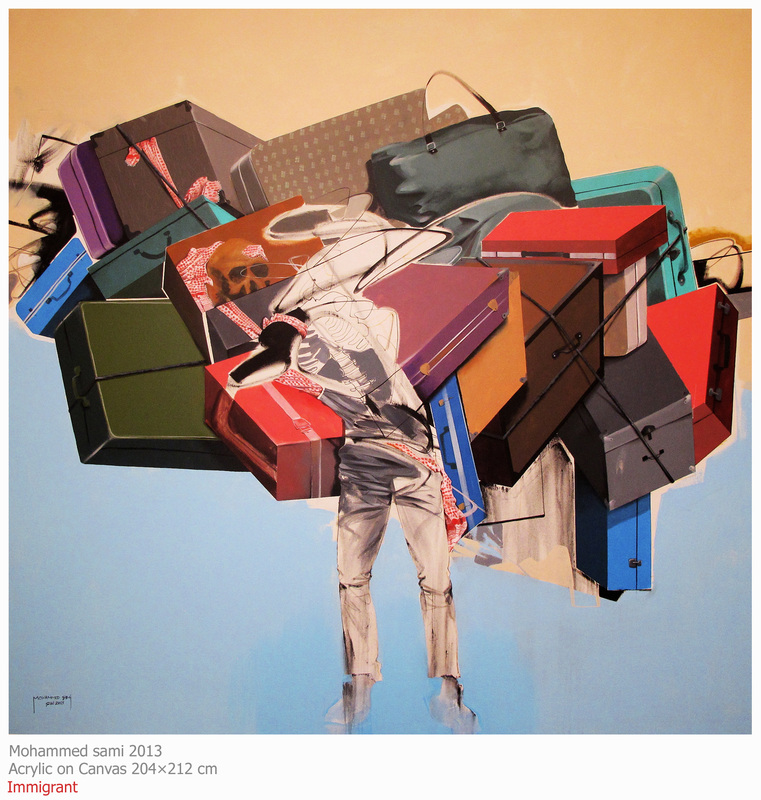 The winning painting by Mohammed Sami is a depiction of a faceless immigrant straining under a a canopy of luggage. Olivia Yu with her fluorescent colour palette and marbled, textured, abstract canvases won the Peoples Choice Award. Whitecross Street itself has a constantly regenerating display of street art along it, and one of the judges, Teddy Baden, is a street artist and organiser of the Whitecross St Art Party every summer was a judge. 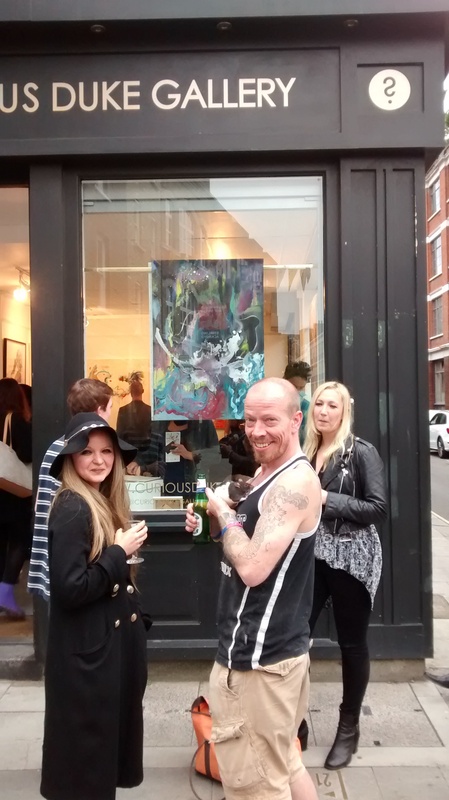 Curious Duke Gallery – 173 Whitecross St, London EC1Y 8JT; the Secret Art Prize is on till 27th of September.